In both building and industry, we often find linear gaps between different parameters of different length, width and depth. These joints comes often from dilatation and the solution of closing them must be elastic to allow certain movement. We find many products in the market suitable for this purpose. The problem lies in the fact that this line joint is between two different fire sectors and the dimensions of it exceed those 50 cm2 that the norm marks as a maximum dimension, from where you have to sectorize correctly in order to avoid the entrance of the smoke, flames and to allow the right thermal insulation. This type of elements, often by ignorance and also for saving costs is left free, or it is treated with “unsuitable” products such as Expanded Polyethylene, Silicones, or even worse, flammable Polyurethane Foams. These last two products, apart from contributing to the fire by releasing smoke, help to the spread of the flame on the other side of the sector. Vertical joints up to 3 cm wide: there are two main methods that depend a little on the final aesthetic finish required by the joint. – Intumescente Tecsel® Mastic: it is similar to a silicone and it can be used both, indoor and outdoor. – Tecsel® foam: it is similar to a gray polyurethane foam. – Tecsel® Flexible Sealant: these are very flexible intumescent foam strips coated with a plastic layer to protect it from the elements, which are tested in joints up to 12 cm wide. – Tecsel® Self-Leveling Silicone is the ideal solution when the joint requires large movements such as forging steps, façades or curtain walls. A rock wool gasket bottom is placed and the product is poured into the gasket. 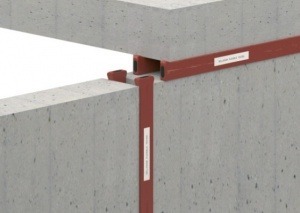 – Tecsel Sealing System: Composed by High Density Rock Wool that is pressed into the joint and then painted with 1 mm of Tecbor Joint Paste ready to use®. We need to take into account that this system “is not passable” and it is necessary to place a tramex or similar in the bottom if it is required.